A summary offence ticket is a document that tells you what offence you have been charged with and provides a report and police record of the facts and information relating to the offence with which you have been charged. Summary offence tickets are issued by peace officers for offences under Nova Scotia laws and some federal laws, but not under the Criminal Code of Canada. They are punishable on summary conviction and may result in fines of not more than $5,000 or imprisonment for six months, or both a fine and imprisonment. The total penalty for the offence (including the court cost and the victim surcharge) is shown on the ticket. This site provides general information about summary offence tickets issued under the Summary Proceedings Act of Nova Scotia and prosecuted in the Provincial Court. It answers questions you may have about the process of a summary offence ticket, including pleading, payments, and hearings. It does not explain the law, though, and may not provide all the information necessary for you to defend yourself on a summary offence charge. Once you have received a ticket, you have two options: to plead guilty or to plead not guilty. To plead not guilty, you or your representative need to bring your ticket to court and complete a Notice of Intention To Appear in Court. 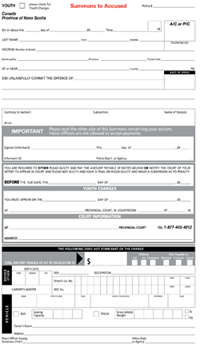 Once this form is processed, you will be provided a court hearing date by the method of your choosing (email, fax or mail). You can view a sample ticket with detailed explanations here (just mouse over a yellow question mark for the help text). Going to Provincial Court is an information pamphlet published by Legal Information Society of Nova Scotia (LISNS). LISNS also offers a Legal Information Line at 455-3135 in Metro or 1-800-665-9779 toll free in Nova Scotia.